Manama, Oct. 30 (BNA): His Majesty King Hamad bin Isa Al Khalifa stressed deep-rooted historic fraternal relations between Bahrain and the UAE which are based on strong foundations of cooperation and coordination in various fields. HM the King was speaking as he received at Safriyah Palace today the UAE Minister of Foreign Affairs and International Cooperation Shaikh Abdullah bin Zayed Al Nahyan, who was accompanied by Minister of Culture and Knowledge Development Noora bint Mohammed Al Ka'abi, on the occasion of their visit to Bahrain to participate in the 8th session of the High Joint Committee meeting. Shaikh Abdullah conveyed to HM the King the greetings and respect of the UAE President Shaikh Khalifa bin Zayed Al Nahyan, Vice-President, Prime Minister and Ruler of Dubai Shaikh Mohammed bin Rashid Al Maktoum and Abu Dhabi Crown Prince and Deputy Supreme Commander of the Armed Forces Shaikh Mohammed bin Zayed Al Nahyan. HM King Hamad welcomed the UAE Foreign Minister and his accompanying delegation and asked him to convey his greetings and best wishes to the UAE President, the Vice-President, Prime Minister and Ruler of Dubai and Abu Dhabi Crown Prince and Deputy Supreme Commander of the Armed Forces. He hailed the outcome of the Joint Committee meeting during which a number of agreements, memoranda of understanding and executive programmes were concluded to boost cooperation and integration in various political, economic, financial, cultural, educational and tourism fields. HM the King praised the ongoing efforts of the committee members to carry out the strategic visions of the leaderships of both countries by opening up new horizons for joint coordination. He also lauded the efforts of the officials in both countries to serve common interests. HM King Hamad commended the UAE's honourable stances in supporting Bahrain and its people, praising the UAE's advanced international status and pioneering achievements at all levels. He also lauded the UAE's commitment to serving Arab and Islamic issues and boosting regional security and stability. HM the King reiterated congratulations to the UAE on launching Khalifa Sat satellite, describing the move as a quality leap in the UAE's tendency to manufacture and launch satellites by relying on local experiences and competencies. 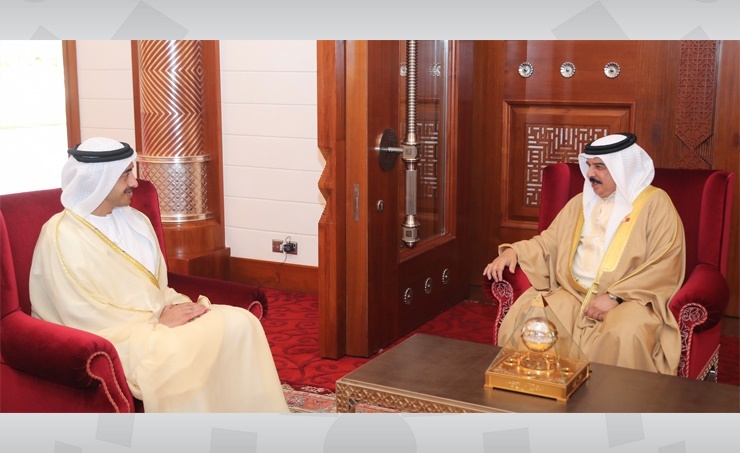 Shaikh Abdullah bin Zayed Al Nahyan lauded the tremendous efforts of HM the King to further cement fraternal ties between Bahrain and the UAE, stressing the unflinching support and care given by the leaderships to bilateral relations.